This week I’m excited to feature the work of fiber artist Michele Landel. Michele is an American living, working and teaching in both Sèvres and Paris, France. She holds degrees in Fine Arts and Art History. Michele creates intensely textured and airy collages using burned, quilted, and embroidered photographs combined with paper and fabric to explore the themes of exposure, absence, and memory. Her embellished mixed media collages have been exhibited in France, Italy, Poland, the UK, and US. 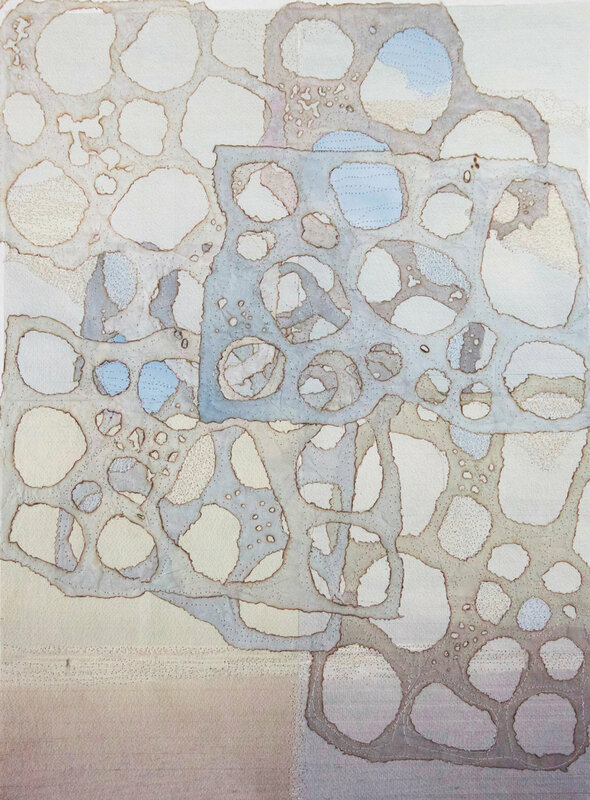 She recently won the Surface Design Association’s “Innovation In Technique Award” and her work is featured in The Collage Ideas Book. I am excited to share more about how improvisation impacts Michele’s work. Improvisation means to create work spontaneously, without a fully formed plan or vision. It is trusting yourself and trusting that something interesting will happen. I don’t always work this way now. Sometimes only part of the process is improvised, while the rest is highly planned and controlled. For example, I have been working on a series called “For there she was.” I start by hand dying the fabrics using natural dyes that I brew in my kitchen. Often, I cannot control the colors and don’t know how the different dyes will react to the fabrics. Then I carefully select, digitally manipulate, print, and cut apart the photographs I will use. There is little that is spontaneous during this part of the process. I lay the images and the fabrics out on my table and pair the fabrics with the images. This part is much more spontaneous. Finally the stitching is often improvised based on the tension that naturally happens between the photographs and the fabric. Improvisation is a natural part of my process. Sometimes to relax or in between series, I make large abstract works that are purely improvised. I start with a blank sheet of paper and layer it with ripped out pages from magazines. I am looking at the colors and focused on finding my pallet. I don’t really care about the content of the pages. When I am satisfied I glue them in place. Over this, I might add another layers for texture (i.e. pages from old books, postcards, paint, gilding, etc.). At this point I might fill-in some of the color with thread and embroidery. Then I will begin burning thinner pages. I often work-in images that I printed for other projects but never used, a bit of a balcony, a face, waves… I have folders full of bits of burned paper to be reused in other projects. Then I will add more thread and sew all these bits in place. The embroidered lines are always improvised based on the way the paper folds or is burned. Here, here, and here are examples of this process. I think it is always a part of my process. I always work in series. This helps me to stay focused and keep moving forward. My work is highly process-driven and there is often a deliberate tension between the improvised and planned. Even when I am working with photographs, I prefer to print on handmade or watercolor paper where I can’t control how the paper will absorb the ink. It also means I can’t control how the paper will tear when I rip it. I find inspiration from fellow artists and friends. I joined a group called Thrive Art Studios a year ago and the women I have met there are constantly inspiring me. I was feeling block in September and the artist, Heather Kocsis from my group encouraged me to think about flow and the energy of water. She said, “the stream might get really tiny, but it finds its way through.” She told me to find my flow, open up to it, and keep adding momentum to it until things start to move more easily. It was great advice and really worked. I looked at what I had been making and there was a tiny thing “silhouettes” that kept coming back again and again. I took that and kept making it bigger and bigger until the block went away and everything started “flowing” again. So, what if, . . . I had more time! Honestly, I’d probably be less efficient and more distracted. What if, . . . I had an enormous studio where I could throw paint! My work would be really different, but you know I am not sure that would be a good thing. I am in a 2-person book club with my dad who lives in Florida. We just finished “The President is Missing.” Before that we read “Together We Rise.” I live in France and so we only see each one or two times a year. This is our way to stay connected. We’re always texting each other about the books. I still read the New Yorker on the metro and I love to listen to podcast in my studio: Jealous Curator, Pod Save America, On Being, RadioLab, This American Life, Meet the Composure, and How I Built This. When I am not listening to podcasts, I have the French radio station FIP on or KUT Austin. I don’t read a lot of the business of art books, but two that I have found helpful are Daybook: The Journal of an Artist by Anne Truit and The War of Art by Steven Pressfield. Thank you Michele for sharing your work and your process. I am mesmerized by your process of burning paper, and more importantly the results! I love your advice for someone wanting to start using improv and believe that it essential not just in improv but in the creation of authentic art. It is also something I know alot of us struggle with regularly, so thank you for the reminder of of trusting oneself its importance! Your 2-person book club sounds like a wonderful way to keep in touch, and reminds me what a loving thing reading is to do with someone. Congrats on your recent SDA Innovation award, I am sure it is the first of many! Please be sure to check out Michele’s work on her website, on Instagram, and in the link content of the interview, and DO NOT MISS the burning fire videos!! !